This article provides in-depth fundamental analysis of Poddar Pigments Ltd, a manufacturer of color & additive masterbatches for dope dyeing of man- made fibres like Polypropylene, Nylon & Polyester Multifilament Yarn/Fibers. 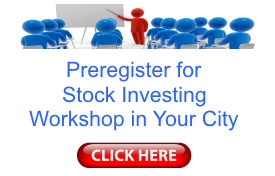 I am Khushwant and attended your workshop in Mumbai in Nov 16. I am highly indebted to you to introduce me to stock analysis. 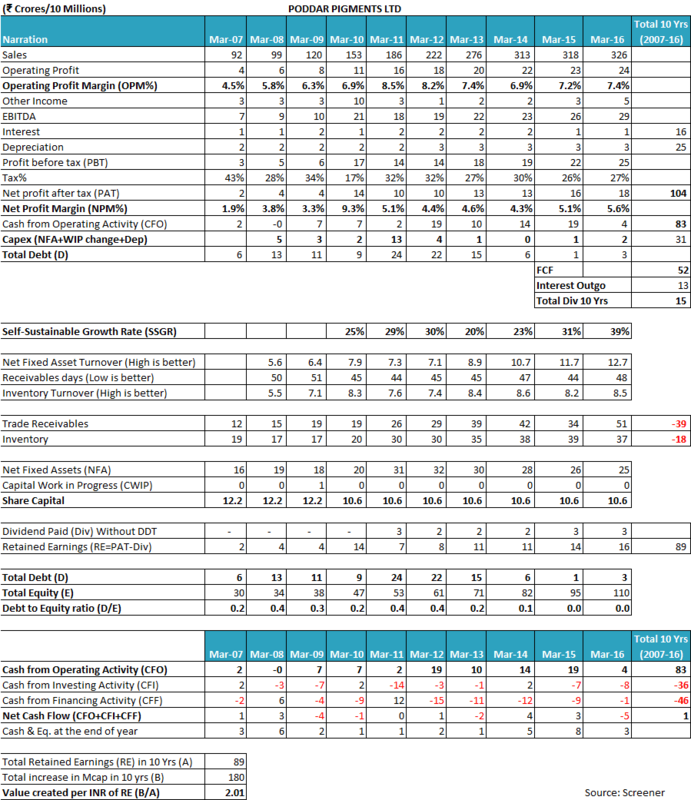 I have attached a word file which is my maiden try to analyse a stock. 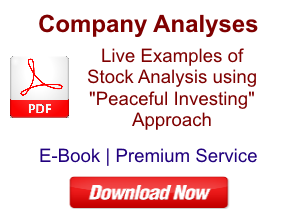 I chose a random stock to get to know how to do the analysis. May I request you to offer your comments on the same, if time permits? Poddar Pigments Ltd claims to be the pioneer in the production of masterbatches for dope dying for the industries of polymer and other man-made fibers. Claimed second best award of exporters of master batches twice. The company’s only business is the deal in master batches and nothing else. The company was established in 1991. It is an ISO certified company as on date. It is a Jaipur based company and has a registered office in Mumbai. The company has increased its production slowly 1200 MTPA in 1995-96 to 13500 MTPA in 2015-16. The sector has no moat and thus has many small and big players from both private and listed companies. The sales have grown at 15% CAGR for the last 10 years. The company has been able to increase at first and then hold its profit margins (operating/net) steady at around 7-8%/5-6%. The OPM has been less as compared to other players in the market like Atul (12%), Sudarshan (10%) and Bodal (9%); however, the company has been able to remain debt free and maintain good positive cash flows. PAT growth is healthy at 30 % over ten years and return on equity is 17%. The sector is set to grow, as the demand for plastics shall increase year on year as unexplored areas are exposed to plastics with continuous urbanization. As can be seen, the company is paying taxes regularly. Here, one needs to mention the cases of income tax pending for the company amounting to around ₹78 lakhs. Another point to mention is the continuously growing deferred tax liability (around ₹4 Cr in AR 16) because of accelerated depreciation. The company has very less debt and interest outgo has been increasing and is at 106.5, a sign of a healthy company. They have varied from 50 to 45 then again to 48. This may be of concern. 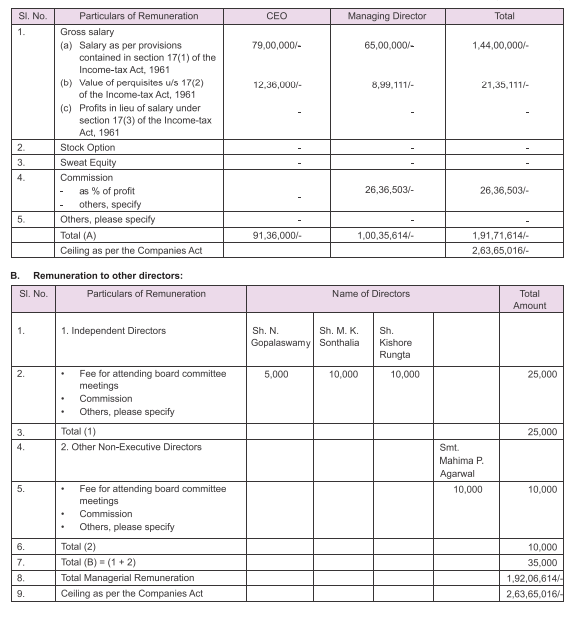 The total outgo towards remuneration of directors is around Rs. 2,30,60,000.00 that is right at the limit of 11% of the net profits as directed by the government of India. If these figures are compared to the figures provided in the other part why there is a mismatch?! The company has ample scope to grow at a sustainable 15%. However, the non-availability of moat and the easy entry of competitors is a cause of concern. There are a lot of Private Players like Prayag which have tremendous capabilities of 50,000MT/A already. The company is thus not a leader per se. This would mean that the Rand D department requirements are even more important. However, the other companies, including private also have an R & D division. Hence, no great moat is available. We can see that the company is generating cash throughout. CFO vs PAT: However, there is a concern of the CFO (₹83 Cr) not matching with the PAT (₹104 Cr). The amount of ₹10 Cr is because of the presence of the trade receivables – the trade payables. The rest of around ₹10 Cr is still not understood by me. NFAT is good at 12. Also, the value created as compared to the earnings retained is around 2.2 times, which are acceptable. The P/E of the company is just about 12 which is also acceptable to an extent and provides a margin of safety. As can be seen, in the FY 15-16, there is no proposed Final Dividend on equity shares. Why is this? Thus, the amount of deferred tax is growing which may be the cause for concern as it has reached to 4.4 Cr. Unpaid dividends have increased. Should this be a cause for concern? No dividends like last year? Why? Why does a company invest in other companies? Should it not invest in itself? The amount is not less at 2.7 Cr and it has increased 2.7 times from last year. Why? Why have these advances increased by 50 lakh? Is this like an internal loan? Trade receivables have increased tremendously. Why? Why are both the receivables considered good? Should these points be a cause of concern? 1. We see that the advances have increased. Advances are given to whom? No mention in the AR. 2. The interest on these advances is Rs 31.13 lakh which is around 5-6% of the total if balances with Govt is also considered. This is a meager amount of interest. But why are they given? The tax matters here and the one mentioned at the beginning of the analysis don’t tally. Here total tax is 94 lac whereas there it was 78 lac. Why is the company paying rent to its CEO’s wife? Also, consultancy charges are paid to the daughter of MD? 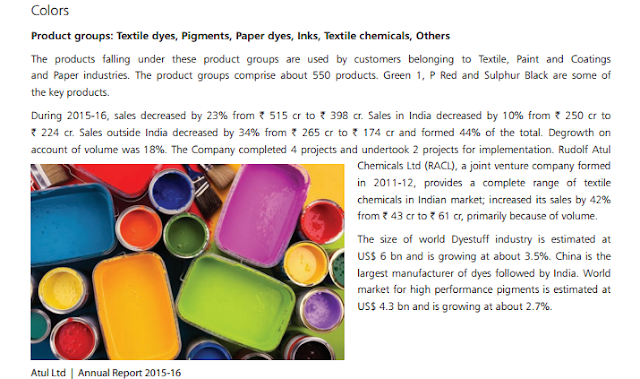 The company has many subsidiaries and a total revenue of around 2400 Cr out of which the dyes and pigments form around 17% of revenue generated. Thus is a small part of the total. Our company, viz Poddar pigments deals only with pigments and had a total revenue of around 340 Cr. This revenue grew whereas we can see that for Atul Ltd it has fallen from 515 Cr to 398 Cr. The company has a lot of subsidiaries. The mainstay of the company is, however, inorganic and pigment manufacture contributing 90% i.e. around 1000 Cr revenue generated by the company. Both have contributed but the growth of sales has been more due to the increase in production by research and development as claimed below. It’s important to note that screener provides the rate of sales growth over past 10 years as 15.1%. Poddar is cheap at the current available valuations as compared to its peers. However, it is a small company. 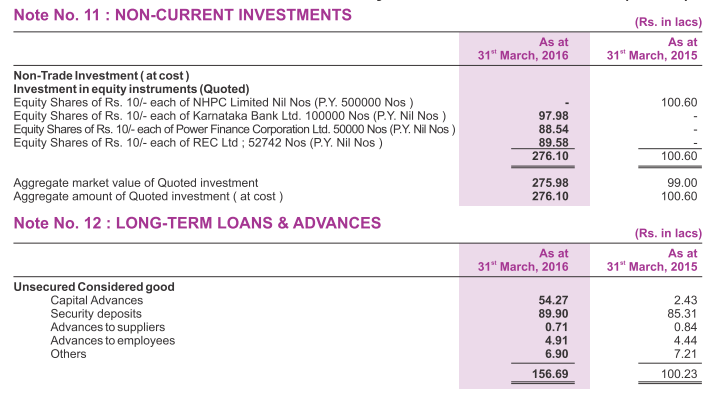 Poddar also has an earnings yield of 11.9% which is higher as compared to G-Sec yields, which are closer to around 8%. Price to book value of Poddar is 1.99 which is a tad high. The dividend yield is 1.11% which may be considered a tad less. Only the remuneration of Shri SS Poddar was analysed as he is the managing director of the company and CFO. This shows that the remuneration is in line with the profits made by the company and is a good sign. We see that the dividend payout is around 2 crores mean. The company is small and has a market cap of only 235 Cr only. Hence, it is growing and still paying out decent dividends. Buyback of shares in 2010. We see that in AR 10 the company has brought back shares from general reserves, which may be construed as a positive sign. The sector of manufacture of Pigments has a lot of private players with a production capacity which overshadows that of the company under consideration. For e.g. Prayag which has a capacity of production at around 50,000MT/A. Where does Poddar pigment stand when compared to such companies? What should be our concerns as retail investors where pvt. players are much stronger than listed companies? 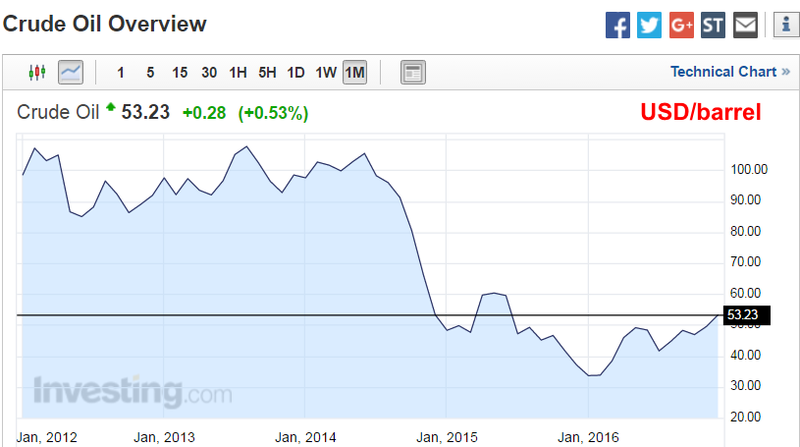 Another concern is the increase in prices of crude oil which may affect the company costs. Many thanks for sharing your analysis of Poddar Pigments Ltd with the readers and the author. 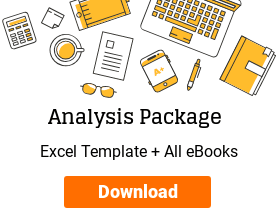 We appreciate the time & effort put in by you in the analysis and making it available to the wide audience. It is pleasing to witness the manner in which you have read each and every section of the annual report of the company both for latest and previous years and have highlighted key points and concerns. The amount of effort put into the analysis including the comparison of Poddar Pigments Ltd with its peers is clearly visible. Your hard work would prove helpful to any investor who might be thinking about analysing Poddar Pigments Ltd.
Let us analyze the financial performance of Poddar Pigments Ltd over last 10 years. Poddar Pigments Ltd had been growing its sales at a pace of 10-15% over last 10 years (FY2007-16). However, as the company has been growing in size over the years, its growth rate has been slowing down from 15% in 10 (2007-16) and 7 years period (2009-16) to 12% in 5 years (FY2011-16) to 6% in last 3 years (FY2013-16). Poddar Pigments Ltd has mentioned in the management discussion & analysis section of the FY2016 annual report that it is currently running its plant at near full capacity. Therefore, it seems logical that the company should do capital expenditure to add to the existing manufacturing capacity so that the growth rate can be sustained in future. 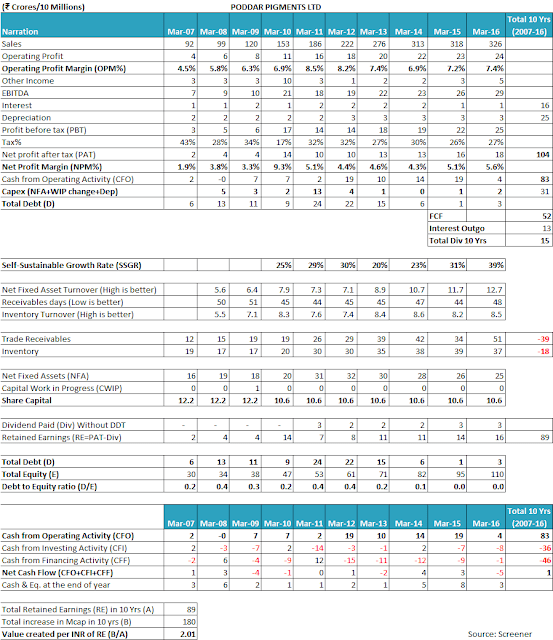 A look at the profitability trend of Poddar Pigments Ltd would indicate that the both the operating profitability margin (OPM) and net profitability margins (NPM) have been highly fluctuating over the years. OPM has been varying from 4.5% in FY2007 to 8.5% in FY2011 and then falling to 6.9% in FY2014 and currently improving to 7.4% in FY2016. Similarly, NPM has been witnessing wide fluctuations from 1.9% to 9.3% in the past and currently hovering around 5.1-5.5% in FY2016. Such low and fluctuating margins indicate that Poddar Pigments Ltd is exposed to margins pressure with changes in the raw material prices. Poddar Pigments Ltd finds it difficult to pass on the increase in raw material prices to end customers. Such situation indicates that the company operates in such an industry where the buyers have much more bargaining power over suppliers and thus can make the suppliers agree to their terms. It is typical for industries, which do not have any entry barriers like technological barriers, high capital requirements etc. As new suppliers can keep on coming into the market and easily produce the material, therefore, the companies in the industry find it difficult to maintain their profitability margins by passing on the rising costs to buyers. The increase in operating profitability margins of Poddar Pigments Ltd in recent years can easily be attributed to the decline in crude oil prices in last 1.5-2 years and the margins may decline in future if the crude prices increase. The above chart indicates that the crude oil prices have declined from in excess of $105 per barrel in June 2014 to about $33 in February 2016. This sharp decline of about 70% in the crude oil prices coincides with the improvement in the operating profitability margin of Poddar Pigments Ltd from 6.9% in FY2014 to 7.5% in FY2016. It remains to be seen whether the company would be able to maintain its profitability margins when the raw material prices increase in future. An investor should keep a close watch on the profitability margins of the company to monitor how Poddar Pigments Ltd responds to the vagaries of commodity cycles. Poddar Pigments Ltd has been witnessing fluctuating tax payout ratio over the years. However, the tax payout ratio though seems to be within a healthy range of 26-32%. Moreover, the company has not disclosed further details about the factors impacting the tax payouts. One of the reasons for the fluctuating tax payout is expected to be the presence of deferred tax liability (DTL), which might be a result of the differential tax treatment of depreciation. For reasons other than the depreciation like export incentives etc. 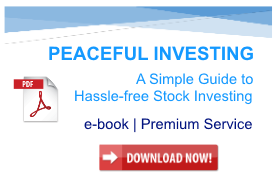 it is advised that the investor should contact the company and get clarifications if any. Looking at the net fixed asset turnover (NFAT) of Poddar Pigments Ltd over the years, an investor would notice that its net fixed assets turnover (NFAT) has improved over the years. NFAT has improved from 5.6 in FY2007 to 12.7 in FY2016. It indicates that there is a lot of improvement in the asset utilization levels. The factor of good asset utilization is one of the reasons that the company has been able to grow without leveraging its balance sheet as it could fund its growth by doing Ltd capital expenditure. Similarly, when an investor assesses the inventory turnover of Poddar Pigments Ltd, then the investor notices that the inventory turnover of Poddar Pigments Ltd has improved over the years from 5.5 in FY2007 to 8.5 in FY2016. Such an improvement in the inventory turnover is a significant achievement for the company as it leads to relatively lower working capital costs for the company as the relatively lower amount of funds remains blocked in the form of inventory. Receivables days of Poddar Pigments Ltd has in the initial period witnessed improvement from 51 days in FY2009 to 44 days in FY2015. However, as highlighted by you, the receivables have increased sharply from ₹34 cr in FY2015 to ₹51 cr. in FY2016 and thereby resulted in an increase in receivables days to 48 days. The receivables have been considered good by management despite part of the receivables being secured and part of them being unsecured as the management believes that they would be able to collect these receivables within stipulated time (credit period). The classification of the receivables in good or bad is at the first level decided by the management itself and the auditors do not necessarily disagree unless the receivables get unduly delayed say beyond 6 months from the date they were to be collected. If the receivables get delayed for more than 6 months and the auditor notices that the probability of the receivables getting collected has deteriorated, then the auditor may ask the management to write-off such receivables. When an investor notices the receivables position of Poddar Pigments Ltd at September 2016, then the investor notices that the receivables are nearly stable at ₹51 cr. It indicates that the sharp rise in receivables at March 31, 2016, was not a one-off year-end incidence but seems that the buyers, in general, have started delaying payments to Poddar Pigments Ltd.
Over last 10 years (FY2007-16), Poddar Pigments Ltd has not been able to convert its profits into cash flow from operations. Cumulative PAT during FY2007-16 is ₹104 cr. whereas the cumulative cash flow from operations (CFO) over the similar period has been ₹83 cr. Interest expense (₹16 cr), which even though deducted as an expense while arriving at PAT, is added back (i.e. adjusted) when calculating CFO. This is done because interest expense is a financing item and therefore, it is deducted from cash flow from financing while preparing the cash flow statement. Trade receivables consumed ₹39 cr. over last 10 years, when trade receivables increased from ₹12 cr. in FY2007 to ₹51 cr. in FY2016. Inventory consumed ₹18 cr. in last 10 years when the inventory levels increased from ₹19 cr. in FY2007 to ₹39 cr. in FY2016. The working capital changes consumed about ₹57 cr. (39+18) thereby reducing the cCFO by equal extent when compared to cPAT. Thereby the expected level of cCFO should be about 104+41-57 = ₹88 cr. The further difference of cCFO actually being ₹83 cr. instead of ₹88 cr. as calculated above, could be explained as a result of the capital gains of about ₹6.5 cr. on the sale of investments recognized by Poddar Pigments Ltd in FY2010. The capital gains that are included in PAT are removed while calculating CFO as these pertain to the investing section and therefore, are added to CFI. As Poddar Pigments Ltd has been growing at a rate of 10-15%, it has been able to manage its growth story without leveraging its balance sheet. At March 31, 2016, Poddar Pigments Ltd has short-term debt of about ₹3 cr. on its books, which consists short-term working capital facilities that are required for day to day operations of a company. These findings of SSGR get re-affirmed when an investor analyses the cash flow from operations (CFO) of Poddar Pigments Ltd with its capital expenditure (Capex) requirements over last 10 years (FY2007-16). During FY2007-16, Poddar Pigments Ltd realized total CFO of ₹83 cr. and out of it, Poddar Pigments Ltd needed to spend ₹31 cr. into capital expenditure, thereby releasing free cash flow (FCF) of ₹52 cr. as surplus for shareholders. The investors would agree that a company which generates good amount of free cash flow (FCF) post meeting entire capex requirement from its operating cash flow (CFO) would not need any debt or equity dilution. The same is true for Poddar Pigments Ltd; it is almost a debt free company with no history of equity raising over last 10 years. All the debt of Poddar Pigments Ltd is short term working capital debt. This data indicates that Poddar Pigments Ltd has used its capital efficiently. Despite meeting its entire capex requirements, Poddar Pigments Ltd was able to generate FCF of ₹52 cr. out of which it distributed ₹15 cr. as a dividend to shareholders (excluding dividend distribution tax) over last 10 years (FY2007-16) and it could also do a buyback of shares in FY2010. Higher SSGR and positive free cash flow indicate the presence of a margin of safety in the business model of the company. This margin of safety has been primarily added by the high fixed asset turnover enjoyed by the company. An investor would notice that the same factor of high net fixed asset turnover (NFAT), which is leading to Poddar Pigments Ltd being able to grow in a debt-free manner over last 10 years, is also the factor that is rendering the industry to very high competitive factors like low barrier to entry. very high NFAT would mean that the business requires very low capital investment and any new player can come up without a lot of entry barriers, which would lead the industry to be very competitive. very low NFAT would mean that the business is highly capital intensive and the companies might not be able to fund their growth from internal sources, thereby leading to frequent debt financing or equity dilution to meet funds requirements. Such companies are characterized by debt-funded growth leading to higher debt burden as the company grows in size over the years. Therefore, as with all other parameters like sales growth, profit margins etc. even with fixed asset turnover, very high as well as very low turnover levels might not be sustainable for the companies in the long run. Strong overall cash flow position of Poddar Pigments Ltd has led to the assignment of a credit rating of “A” to the debt facilities of the company by the credit rating agency CRISIL Ltd, which is a good credit rating. While analysing the annual report for FY2016, an investor would notice that the company has received 2 complaints from SEBI, which as per company were resolved. An internet search did not provide any meaningful information about the nature of these complaints. It is suggested that an investor should contact the company directly to understand what these complaints pertained to. The statutory ceiling of 10% of net profits put on the remuneration of directors of the companies by companies act, stipulates the calculation of net profits as per section 197 of the act. 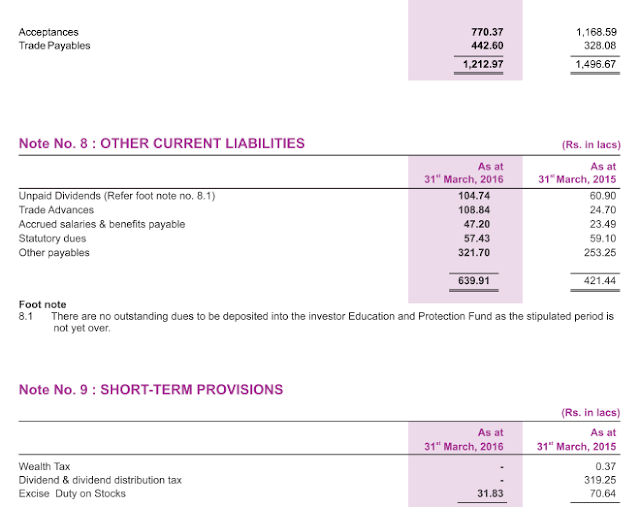 The broad adjustments to the PAT, which approximate it close the net profit as per the section 197 are mainly: income tax and the remuneration of the directors though there are many other adjustments need for exact calculations. However, from our assessment purpose, we believe that the investors should compare the managerial remuneration with the net profit after tax (PAT). The total remuneration of the directors of Poddar Pigments Ltd (₹1.92 cr) is about 10% of PAT for FY2016 (₹18.34 cr). The remuneration of 10% of the PAT is on a higher side with both CEO and the MD taking remuneration of about 5% each. We have seen that most of the times the promoter directors take remuneration of about 2-4% of the profits, which includes the commission of about 2% of the profits and the rest being salary and other components. Regarding the difference in the remuneration figures in different sections of the annual report, we suggest that the investors should write to the company. The company would be able to clarify whether the same is a typological error or they have treated different components of remuneration differently at separate sections of the annual report. Poddar Pigments Ltd has been paying a regular dividend every year since FY2011. In FY2016, it declared an interim dividend of ₹2.50 per share in March 2016 and skipped the final dividend. An investor would remember that in the budget for FY2017, the union govt. has proposed a tax on dividend income exceeding ₹10 lac in the hands of the investors, which came into force on April 1, 2016. As a result, many companies rushed to declare dividends in March 2016 to avoid the impact of the new tax. The case of Poddar Pigments Ltd also seems to be a similar one in which the company preponed the dividend payment to March 2016 as interim dividend to avoid the tax impact on key shareholders and as a result did not declare any final dividend for FY2016. Companies are required to deposit unpaid dividends in the Investor Education & Protection Fund if such dividends remain unclaimed by the shareholder for a period of seven years. Such cases of unclaimed dividends may arise because of any reasons like loss of dividend cheque in transit, change in address of shareholders, the demise of the shareholders etc. The increase in such dividends in not in the hands of the company, therefore, we should not derive anything from this information until the company fails to deposit the unpaid dividends older than seven years into the Investor Education & Protection Fund. Failure to deposit the dividends might indicate the liquidity crunch within the company. Deferred tax liabilities arise on account of differences in the income tax to be paid by the company as per the companies act and the income tax act. Whenever the tax liability as per the companies act is higher than that as per income tax act, a deferred tax liability is created. Similarly, a deferred tax asset is created when the tax to be paid as per the income tax act is higher than that as per companies act. We believe that deferred tax liabilities are a good for companies as they are able to defer tax payments to the future. However, this is only true for companies, which are able to defer tax payments using legal routes. The tax payments, which are deferred in future effectively provide an interest-free source of funds for the company. An investor is right in questioning the rationale of investing shares of other companies especially when these companies are not the business extension of the company like subsidiaries or joint ventures. In the case of Poddar Pigments Ltd, it comes to the investor’s notice that not only the company is investing in stocks of listed companies but it also keeps on rotating the investment in stocks in quick time. This might tantamount to an effort at short term trading and speculation, which is visible from the analysis of annual reports of FY2016 and FY2012 when the company sold its equity investments within one year. Moreover, the investor would notice that the non-current investments done by Poddar Pigments Ltd have increased significantly in H1-FY2017 and now stand at ₹10 cr at Sept 30, 2016, rising from ₹2.76 cr. at March 31, 2016. Capital advances are usually the advance payment for procuring capital goods, which in turn get used in the plant & machinery of the company as part of fixed assets. The increase in capital advances indicates that the company is doing/planning any capacity expansion, upgradation of plant & equipment or major maintenance capex. Advances recoverable in cash or kind are usually items like prepaid expenses like an insurance premium, advance tax, VAT credit receivable, Service tax credit receivable etc. Other advances items are self-explanatory. 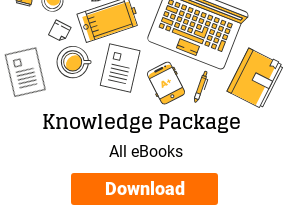 The interest income on these advances will depend upon the contribution of different items in these advances as many of these advances do not earn any interest income. Therefore, we do not believe that a comparison of interest income on short term loans & advances (STLA) with the total amount of STLA and then comparing it with the normal fixed deposit yield etc. would lead to a correct conclusion. It is usually expressed as “estimated amount of contracts remaining to be executed on capital account and not provided for”. This amount includes all pending expenses to be incurred by the company on its capex plans (both expansion and maintenance capex) as per its immediate plans. We believe that the best source to get clarification of these differences is to contact the company directly. Related party transactions where a company pays rent or consulting charges to the relatives of the promoter are always grey areas. This is because it can easily be a method to take funds out of the company for the benefit of the promoter/family members. On the contrary, when an entrepreneur is setting up her business, then she might rely on family members to provide support in terms of office space in their premises etc. However, once the business reaches a significant size and more so when the company gets listed, then such kind of transactions should be avoided by companies. Intermediary products are the products, which are formed in the intermediate steps in the process of conversion from raw material to final product. Moreover, any product which is formed during the product manufacturing process can be termed as an intermediary. Many times, companies find buyers for such products and sell them into the market. Different agencies like Govt agencies classify products under multiple segments for the ease of categorizing companies & products for taxation and other administrative purposes. Many times, multiple products of the manufacturing chain are clubbed together as intermediaries. The companies, for whom the sale of these products constitutes more than 10% of their sales, need to classify it as a separate segment. Our analysis above has indicated that Poddar Pigments Ltd operates in an industry, which does not have any entry barriers and thereby the suppliers do not have any power over the buyers. This is reflected clearly in the fluctuating profitability margins of the companies, which find it difficult to pass on fluctuations in the raw material prices (including those linked to the global crude prices) to the buyers. The fact highlighted by you in the write up that there are many more players, which have much higher capacity than Poddar Pigments Ltd, is one of the reasons, which leads to the industry being highly competitive. Poddar Pigments Ltd is currently available at a P/E ratio of about 10, which provides a margin of safety in the purchase price as described by Benjamin Graham in his book The Intelligent Investor. However, as highlighted by the above analysis, there are many issues related to the company’s business operations like lack of pricing power and the management aspects like high remunerations and related party transactions, which would always influence the price multiples that the markets would assign to any company. An investor should convince herself with all the aspects of the company before she gets attracted to the low P/E multiple of any company. Over last 10 years (FY2007-16), the company has retained earnings of about ₹89 cr out of its profits and has generated a market value of about ₹180 cr. It indicates that the company has generated about ₹2 for every rupee retained by the company from its shareholders. Overall, Poddar Pigments Ltd seems to be a company, which has been growing its sales at a moderate pace with fluctuating operating margins indicating low supplier’s power over its buyers. The recent increase in profitability seems more due to the fall in commodity raw material prices and it remains to be seen, whether the improving margins remain sustainable in future. The high net fixed asset turnover has enabled the company to achieve its growth with Ltd capex leading to good cash flow position. However, the same high fixed asset turnover has been working against the industry and the company by making the market open to easy supply additions by existing and new players. The Recent rise in receivables of the company are a cause of concern and an investor should keep a close watch on the receivables position of the company going ahead. These are my views about Poddar Pigments Ltd. 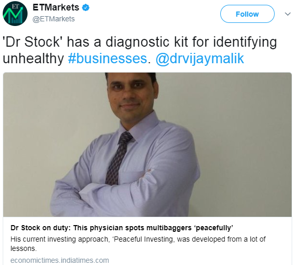 However, you should do your own analysis before taking any investment related decision about Poddar Pigments Ltd.
An investor should keep a close watch on the profitability margins and receivables position of Poddar Pigments Ltd in future.